This sequence of images shows the Sun from its surface to its upper atmosphere all taken at about the same time on Oct. 27, 2017. 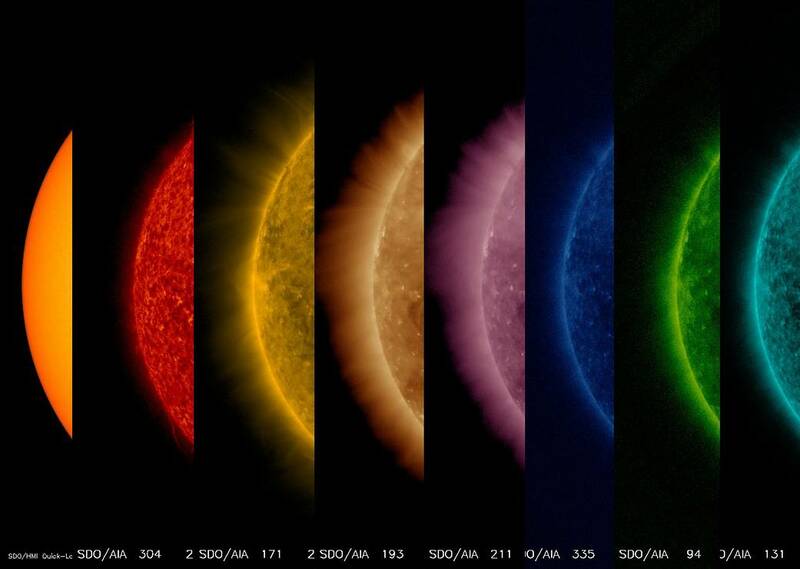 The first shows the surface of the Sun in filtered white light; the other seven images were taken in different wavelengths of extreme ultraviolet light. Note that each wavelength reveals somewhat different features. They are shown in order of temperature from the first one at 6,000 degree C. surface, out to about 10 million degrees C. in the upper atmosphere. Yes, the Sun's outer atmosphere is much, much hotter than the surface. Scientists are getting closer to solving the processes that generate this phenomenon. This video of the sun based on data from NASA's Solar Dynamics Observatory, or SDO, shows the wide range of wavelengths -- invisible to the naked eye -- that the telescope can view. SDO converts the wavelengths into an image humans can see, and the light is colorized into a rainbow of colors.